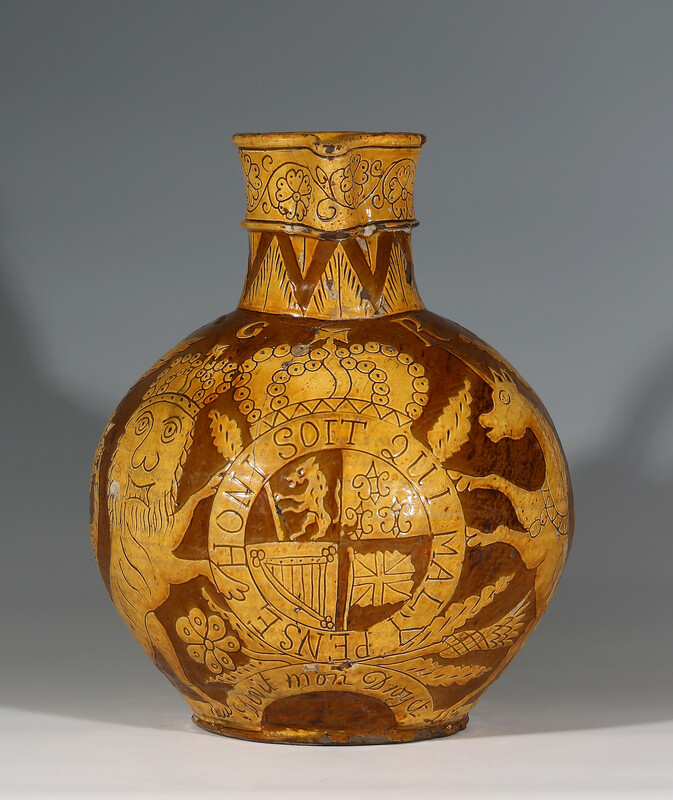 Incised under a lead glaze through a white slip to the brown body with the Royal Arms within the Garter surmounted by the crown and GR for George III, flanked by lion and unicorn supporters and carnation sprays. 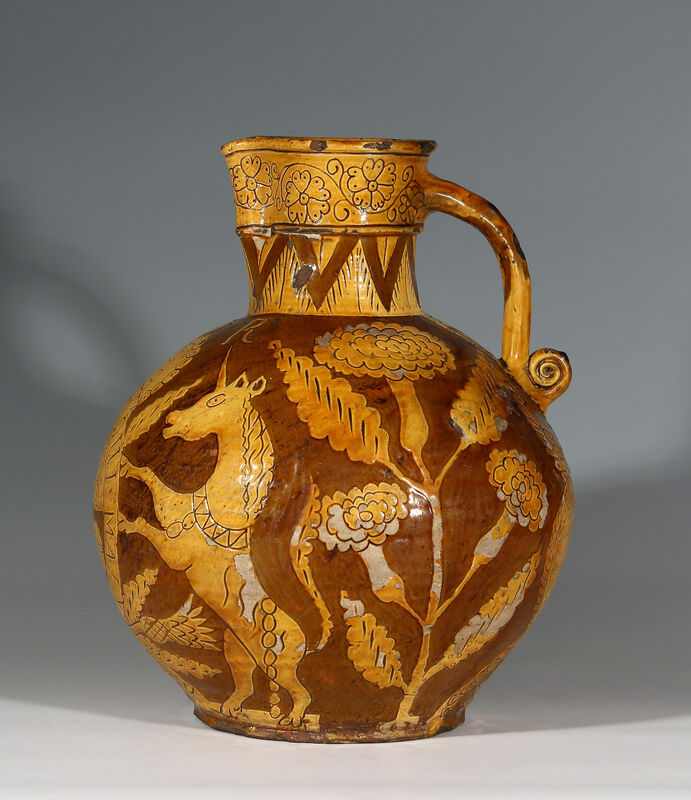 The Metropolitan Museum of Art has a very similar jug (Accession No: 69.47.2) possibly by the same hand with an inscription which ends “Robt. 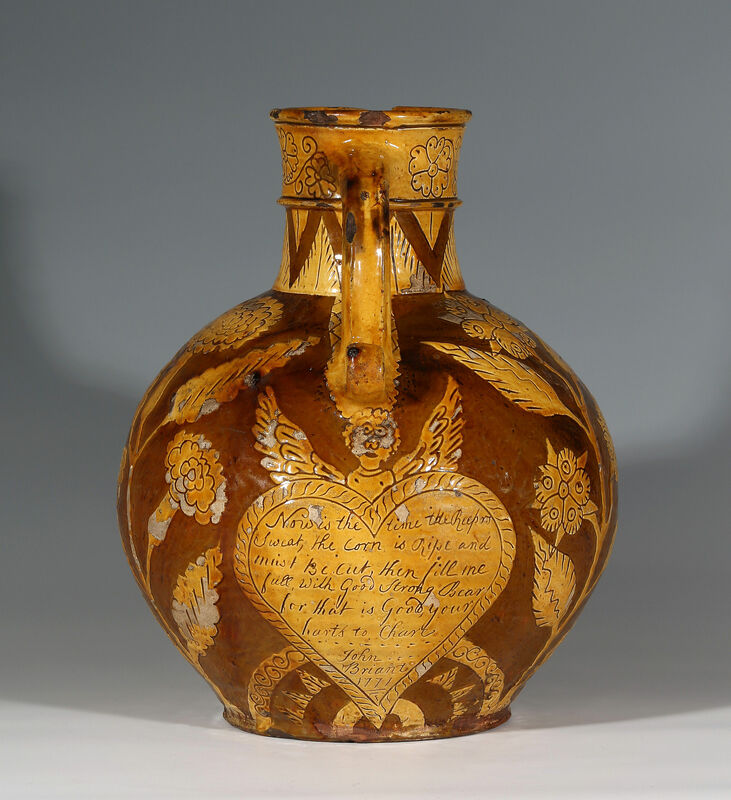 Burnal of Cutcombe/Cutcombe/ Ashel/1781 and a smaller example in the Longridge Collection dated 1791 bears the name S. Evans. These names and the name of John Briant on our jug are of the recipient or commissioner. 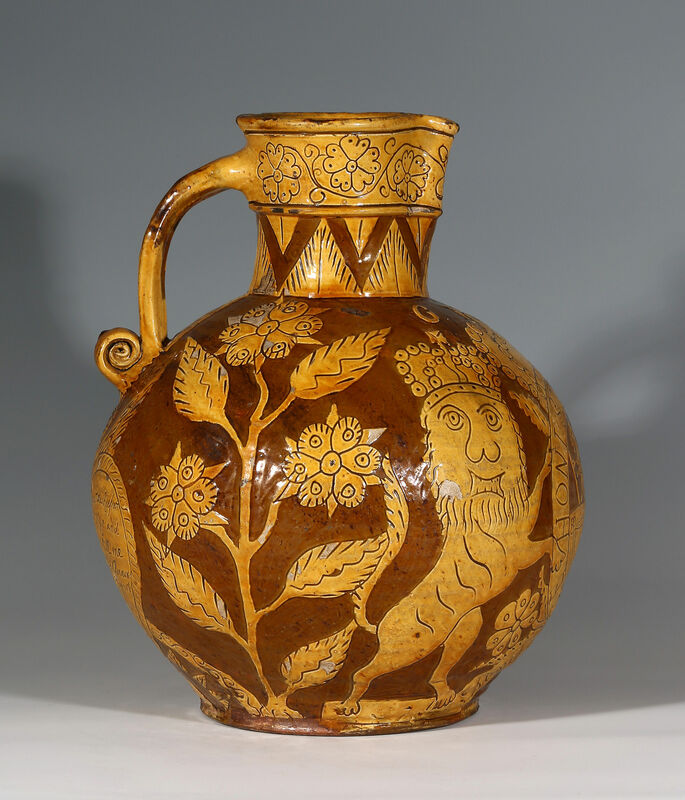 Leslie Grigsby states that “More than a dozen eighteenth-century Royal Arms jugs are known, some with dates from as early as the 1730s” (The Longridge Collection of English Slipware and Delftware, Leslie B. Grigsby, 2000, vol. I, p.144). This is an unrecorded example. 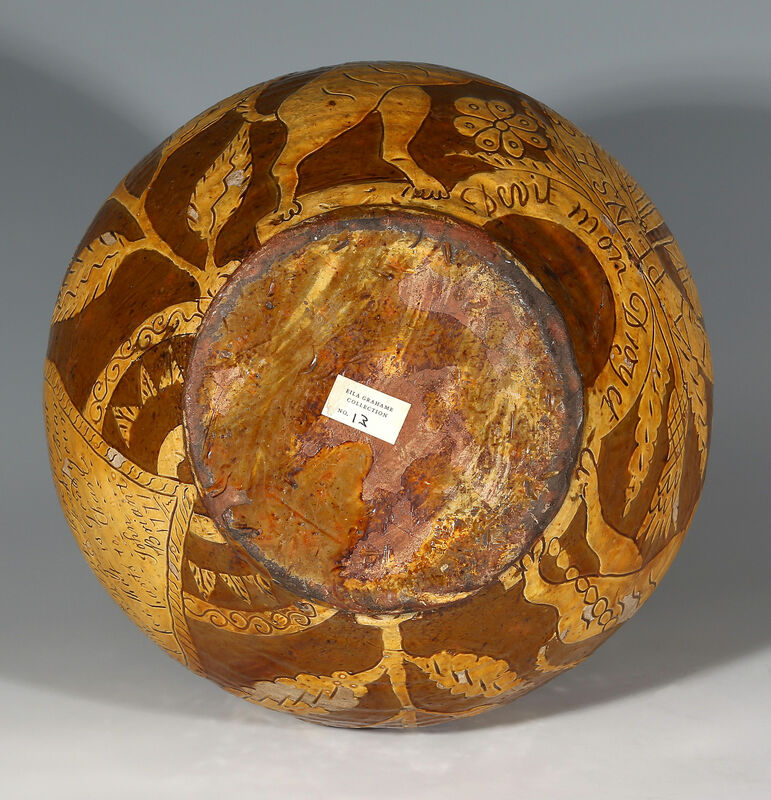 Condition – Flaking to the glaze over the white slip (this is fairly typical). Long crack from the neck through the crown which forks through the arms to the foot, this has been stabilised. Provenance – Paper label on the base: Eila Grahame Collection No. 13. Eila Grahame was a much respected (and colourful) antique dealer who died in 2009. A specialist in glass with a wide ranging knowledge in object of all sorts. She privately collected ceramics.